The Softube Mix Bundle is a collection of our finest plug-ins - five essential tools that give you full control over the key elements of building a mix. The TSAR-1R is based on a powerful, proprietary modern reverb algorithm. It's alive and vibrant, gentle and dreamy—and above all, natural and believable. We've wrapped this versatile beauty in an exceptionally accessible interface—three knobs give you fast, immediate control over a wide range of ambient spaces. Based on a famous German three-band passive console equalizer from the 60s, the Passive Equalizer features wide bandwidth and unsurpassed clear and open sound. A modern active design based on Swiss hardware from the 70s. Three bands of EQ, each with selectable gain, frequency, and bandwidth, plus 18dB/Oct high and low cut filters, give this versatile equalizer a tight and focused sound. A novel and untraditional take on equalizers, with the low, mid, and high bands moving automatically and musically in relation to the high and low cut filters. Features the filters from the Passive and Active Equalizers, as well as an outstanding one-knob saturation control. 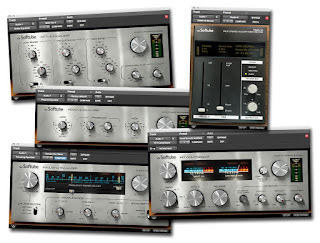 A fresh spin on one of the most famous compressors of all time, updated with parallel compression, detector filters, look-ahead function, and external sidechain. Available from authorized Softube dealers only. For more information, sound examples, etc., please see the individual product pages.